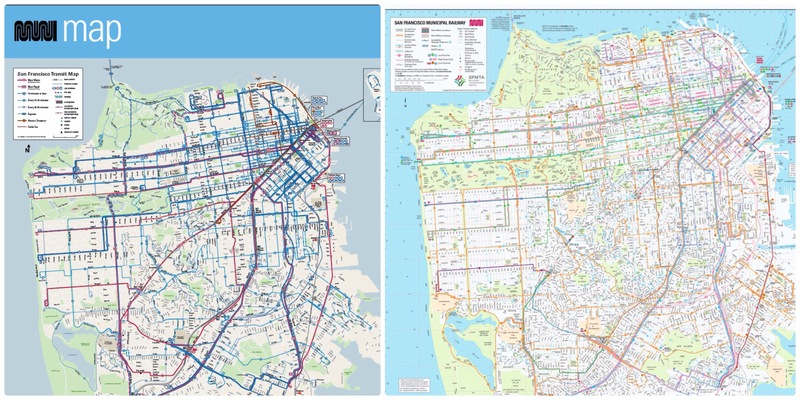 A side-by-side look of the the old and new Muni maps. The San Francisco Municipal Transit Authority launched a Muni service increase over the weekend. Called Muni Forward, the changes included a new map that offers a cleaner, more readable perspective of the bus, light-rail, streetcar and cable car routes, but I’m wasn’t happy. Most of the following post is adapted from a comment I left on the SFMTA site. I suppose it’s nice that it’s a cleaner presentation, but there are so many things missing from this new map compared to the last version. As someone who is only a frequent visitor, I appreciated being able to orient myself with the Muni map by comparing routes with landmarks that I’m either near or where I would like to go. Most of that is gone with the new map. To give a recent example, I wanted to visit the first weekend of the Cherry Blossom Festival in Japantown. I knew the general location and the route, but I was much more comfortable telling my traveling companion where we were going when I could point it out on the transit map at the nearest shelter. 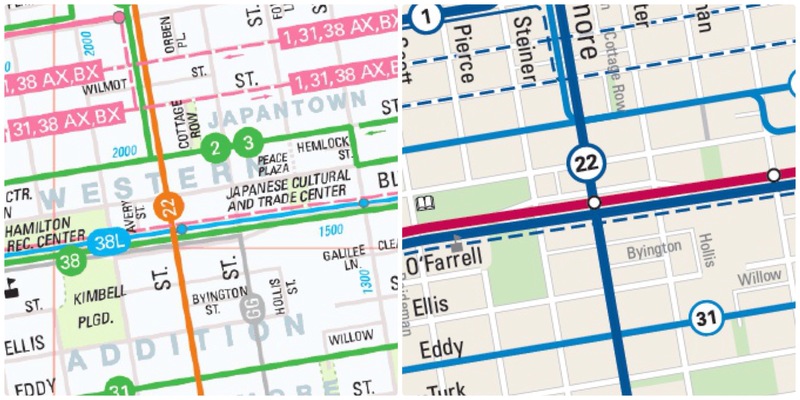 A side-by-side comparison of how Japantown is depicted in the old and new Muni maps. I couldn’t do that with the new map. There’s no neighborhood labels, even for the more commonly known ones (including Chinatown). If I wanted to know where Haight-Ashbury, North Beach, Castro and Mission were located, I couldn’t easily know for sure with the new map. While major streets are identified, the names of many smaller streets are omitted. If I wanted to go to a specific place in the Presidio, like Fort Point, Crissy Field or the Walt Disney Family Museum, I could easily find those locations before whereas this new map of the Presidio is a relatively blank, green canvas. The new map is even missing the Palace of Fine Arts, which is one of the most-common sights in the city. 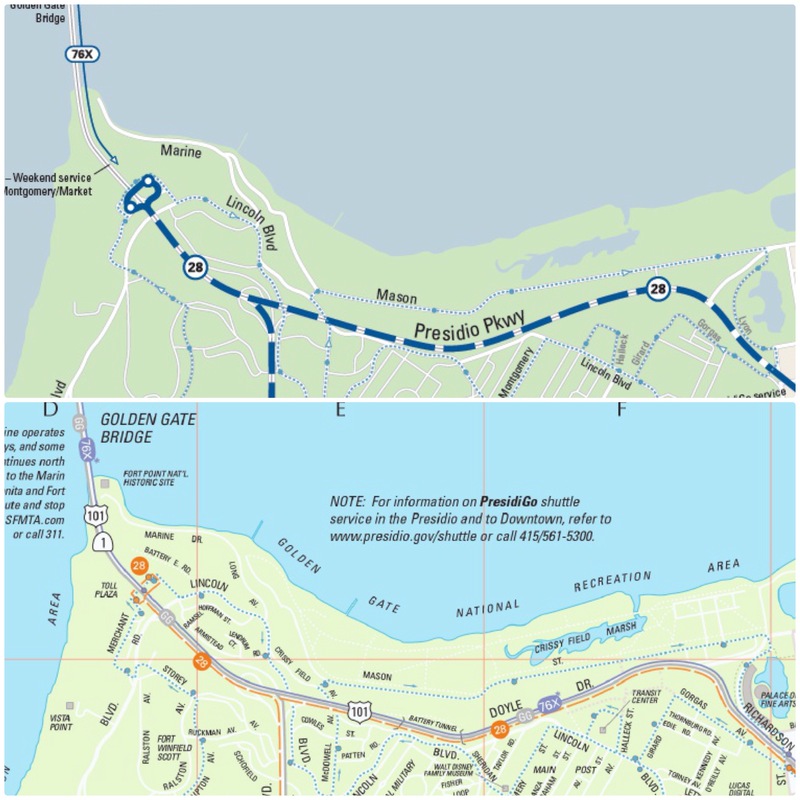 A side-by-side comparison of how the Presidio is depicted in the old and new Muni maps. The map does have some advantages. Even looking at my examples, the map is easier to read and discern information about transit routes. It’s easier to follow some routes and determine when some limited-stop Rapid routes don’t stop for boardings and alightings. Perhaps the map doesn’t need to provide as much information as it used to. After all, we’re in a world of smartphones, where most knowledge is available near instantaneously. Even before that, there were tourist guides and maps in multiple languages to guide people through this city. However, cellphone batteries die and people don’t always have tourist guides on hand. Tourist guides and maps also tend to focus on the most popular or common, whereas the old map featured playgrounds, museums, community centers, even pier numbers. I don’t know what the priorities were for this new map, but it doesn’t seem as user-friendly as it could be for tourists, visitors to the city or residents traveling to new neighborhoods. It’s missing many of the landmarks and detail that give much of San Francisco its vibrant identity. The map is ultimately a disservice to many transit users and will force them to turn elsewhere for less-optimal solutions. The older, unofficial University of California seal is displayed to the left of the system’s recent monogram logo. Use of the new logo was suspended Friday amid complaints from alumni and others. In an age where perception can mean everything, the University of California had a rough week trying to put a new foot forward. Although I had reservations about the final product, I thought it made sense for the university system to try something bold to attract future students and leaders. Less than a week after news broke about the university system introducing a new logo, the university pulled it down after much criticism and controversy. Here’s where perception comes in — for something that caused such sudden outrage, the UC had apparently introduced the logo quietly months ago with nary a word. Also, it wasn’t meant to fully replace the unofficial seal,* as some made it out to be. It also wouldn’t replace or surplant the identities or branding of the individual campuses (UC Berkeley’s or UCSD’s “look” would remain the same). As a university statement pointed out, the new monogram and overall new look were intended for use on systemwide documents and presentations, but not diplomas or similarly formal documents. While a handful of people liked the new University of California logo, a great many more vocally hated it. When I shared the new logo on Facebook, a couple of friends quickly pounced on how the half-finished, yellow “C” placed at the bottom of a stylized, blue “U” looked like either a loading graphic or a birds-eye view of a flushing toilet. I had mixed feelings about the design — it was difficult to tell at a glance what the “U” was and the “C” looked incomplete. I felt better about the monogram and what it meant after watching a slickly produced video introducing the new look. However, if you need a video to explain the changes, it may be a sign that your effort has missed the mark. However, the monogram had been designed with several variations to work in different contexts. In one variation, it could be superimposed over a photo — something that would be nearly impossible to pull off with the older seal. A variation of the University of California monogram. After poking around the UC’s currently defunct branding website, I saw several versions of the logo that seemed to be improvements over what had been circulated. At the same time, I can understand why they went with the logo they did — the one- and two-color monograms may look a little too simple. The “C” looks a little too cartoonish by my eye. Whatever my reservations, I also tried to look at this logo from the eyes of a high school junior or senior looking to enroll at at UC campus. When perusing through paper brochures and online info sites, what would stand out more — the new logo or the older seal? Even then, some have pointed out that the quality and type of school matters more than a simple logo. That would seem to be the biggest potential impact of the new logo. Otherwise, I think a lot of the other concerns are overblown. The new logo would have appeared on systemwide documents and marketing materials. Most people probably don’t encounter such things very often, and it’s hard for me to see how much harm the new logo would do if people noticed it. While I hope the UC develops an identity that people will like, it may be a difficult row to hoe. In general, it seems difficult to implement a logo that isn’t simply a wordmark, given today’s design aesthetics and need to work on a variety of media. I hope there is a way for logos to survive — I’m not huge fan of simply putting your name in a fancy font and calling it good. I don’t have logos for my sites, but I wish I did. Although we’ve had the current seal since 1910, the university has tried several variations over the years, particularly for anniversaries or special uses. Many of them simply aren’t that great and underscore the difficulty in trying to come up with a simplified or stylized variation of the seal. The design of the UC’s Presidential Medal, as seen on an archived version of the UC website. To me, the variations that stand out are the 125th anniversary logo (which may seem too similar to the current California State University system logo) and the university flag (which is echoed in the presidential medal). The flag and medal design include a large “C” enveloping a book with the university motto. Both elements are placed atop a horizontal ribbon. The flag includes an arc of stars to represent each individual campus, which I thought was a nice touch. I would be happy if a variation of the flag/medal were adopted into a logo to supplement the past and current seal. It may not be as bold as the now-defunct logo, but the “Big C” flag/medal design stands out more than the current seal and is fitting for a university system like the University of California. Today marks the launch of The Buzz with a fresh facelift. The new design is geared to offer a cleaner, more dynamic look at the area’s lively arts. While the look is streamlined, all of The Buzz’s regular features are there. We also have updated ways to browse upcoming movies and events. Please take a look — either in print or with the samples below. As the designer who oversaw the process, I’m excited by the end result and I hope you will be as well. Opening pages up: Since we launched the old design years ago, we had changed how tall Buzz pages were and the design was starting to feel cramped. It was time for a flexible design that looked great. Last December, I sat down on a Saturday and took the previous edition of The Buzz. Using a concept page that I have previously designed, I spent several hours redesigning the section. I moved elements around, updating fonts and styles and seeing how everything fit. After some tweaking and input from others, it became the blueprint for the new design and launched with the arrival of our new Buzz editor Jammie Salagubang. Here are the music pages from the old and new designs. The new design opens up the entire width of the page for photos and articles (it was very difficult to have side-by-side articles in the old design). Some of the new pages explode with color. New elements: In the old design, the calendar and movie capsules had interesting information for people looking for stuff to do on weekends, but the presentation was mostly a sea of grey text. The new movies section features a “What’s Playing” guide. At a glance, readers can see all the movies playing at every theater. There are also ratings, review scores and more. The new calendar makes it easier to spot key events in the week ahead. encourage people to hold onto the guide for the entire week. Ultimately, I view the new design as an evolution of The Buzz. In the weeks to come, we’ll have some new ways to showcase local events in the area that I hope you’ll enjoy. Feedback: Please let us know what you think by leaving a comment on this blog. I’m sure Jammie would also appreciate your feedback at buzz -at- chicoer dotcom. Another Christmas is upon us. To celebrate 2009, I created a new card for friends and family. I sent most of the cards on Monday, and I hope they were received by today. If not, I’m sharing the card with everyone here. From the bottom of my heart, I wish everyone the merriest of Christmases. Sharing was this year’s theme. Last year, I tried to combine something uniquely Chico with the holidays and came up with the yo-yo card. I thought about revisiting the Chico themes for 2009, but I didn’t feel I could pull anything off in time. 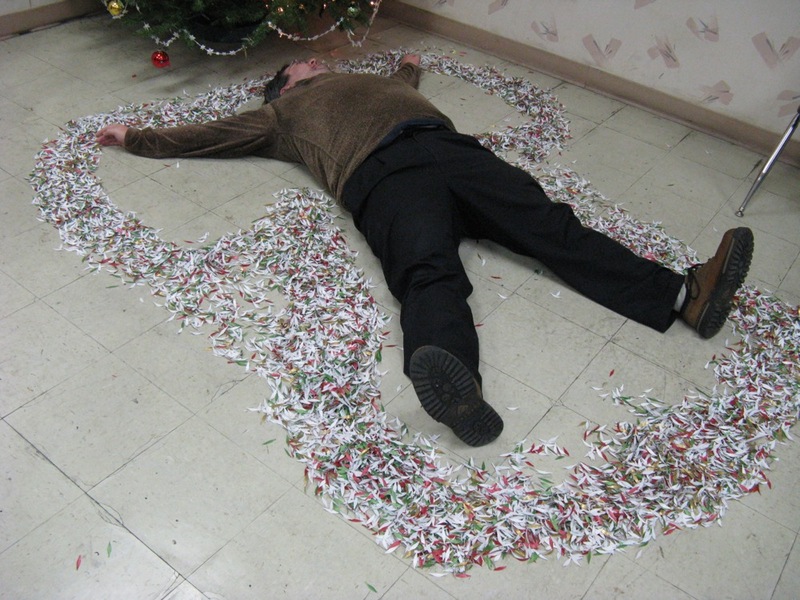 I still liked the Sierra Nevada Santa idea, but I grew a little reticent. After all, it seemed a little less than wholesome, but it could be pulled off if it was done tastefully. I worried about my ability to do so. It’s still an idea I may do in future years. 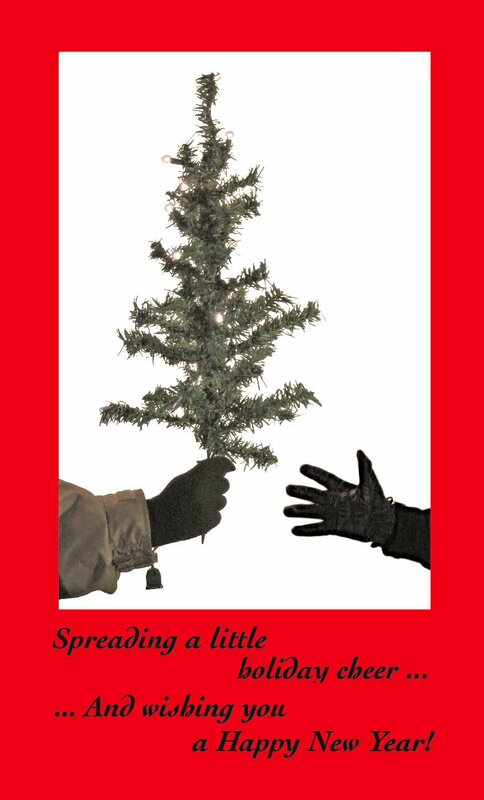 I settled on “spreading a little holiday cheer” because I wanted to do something active beyond the traditional holiday photo. I settled on the tree because I thought it was an unlikely object one would give, but it’s also an icon that embodies the spirit of the season. 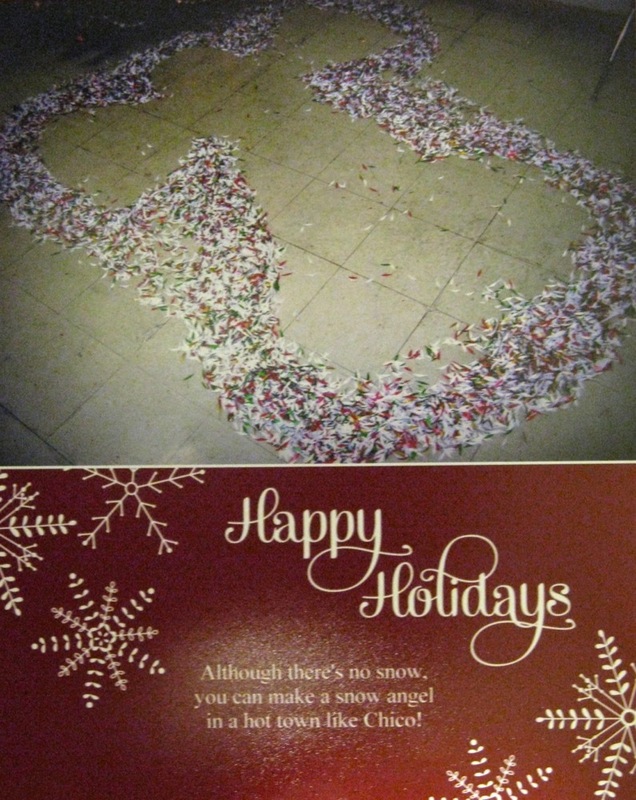 So with many, many test shots in my apartment’s small hallway and some Photoshop magic, here is this year’s card. Merry Christmas. 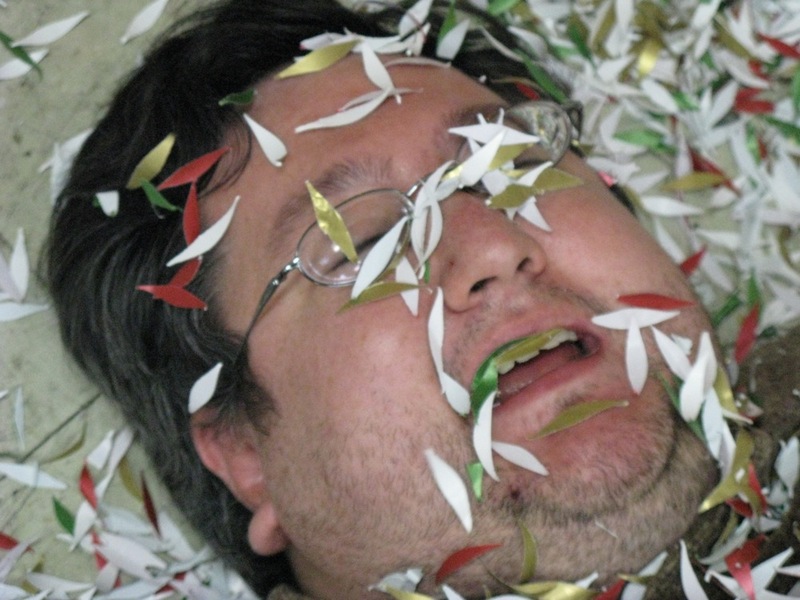 No one liked my object d’arte idea. Especially when I used a creepy holiday decoration at a nearby restaurant as the prop. The Senator ornament idea got a lukewarm response. Some noted that the Senator was an unusual object for holiday decoration while others liked the idea. The City Plaza Christmas Tree idea was greeted by only chirping crickets. But, hands down, people liked the Sierra Nevada Santa. The Santa idea was hugely popular with people saying I should definitely do it. Now it is my responsibility to carry this off in a tasteful fashion. I think that will be the key for success. Part of my problem is finding the right “look” for Santa. As I said before, I want to depict the fun and warmth of the earlier campaign involving the cola-flavored sugar water. Some people have suggested giving a bottle to a mall Santa. A mall Santa. Regardless of what one may think about mall Santas, I just think there are too many variables in play there. I also want to be a part of the photo, so I don’t think a mall Santa can play the role of Santa for my card. Someone suggested the idea of my posing with mall Santa and a bottle of Sierra Nevada, but that just disconcerts me. I think the best person for the role of Santa for my Christmas card is me. So, now all I have to do is find a Santa suit.